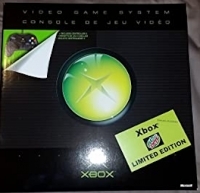 The Mountain Dew Limited Edition Xbox was only available through a Mountain Dew sweepstakes requiring loyal Dew-drinking Xbox fans to amass 550 points in order to "buy" the Limited Edition Xbox. The sweepstakes spanned 5 months – from April to August 2004. Production was limited to 5000 units. Within 1 day all systems were reserved. The Mountain Dew Limited Edition Xbox is neon-green colored and has a special jewel atop the Xbox that has the words "Limited Edition" and the Mountain Dew logo under the Xbox name. Included with the neon green console is one of two games: Project Gotham Racing 2 or Amped 2. 04-11-2018 kreton Description Units Available: 5000 Retail Price: $99.99 + $8.75 shipping + 550 Mountain Dew points The Mountain Dew Limited Edition Xbox was only available through a Mountain Dew sweepstakes requiring loyal Dew-drinking Xbox fans to amass 550 points in order to "buy" the Limited Edition Xbox. The sweepstakes spanned 5 months – from April to August 2004. Production was limited to 5000 units. Within 1 day all systems were reserved. The Mountain Dew Limited Edition Xbox is neon-green colored and has a special jewel atop the Xbox that has the words "Limited Edition" and the Mountain Dew logo under the Xbox name. Included with the neon green console is one of two games: Project Gotham Racing 2 or Amped 2. This is a list of VGCollect users who have Microsoft Xbox - Mountain Dew Limited Edition in their Collection. This is a list of VGCollect users who have Microsoft Xbox - Mountain Dew Limited Edition in their Sell List. This is a list of VGCollect users who have Microsoft Xbox - Mountain Dew Limited Edition in their Wish List.